In popular culture across the world, the Phoenix is a powerful allegorical symbol of tenacity and rebirth. Carrying out its existence in a series of regenerative cycles, it combusts into a spectacular burst of flame when it reaches the end of its lifetime - and then from its remains forms itself into a new bird, brilliant as the scorching sun. 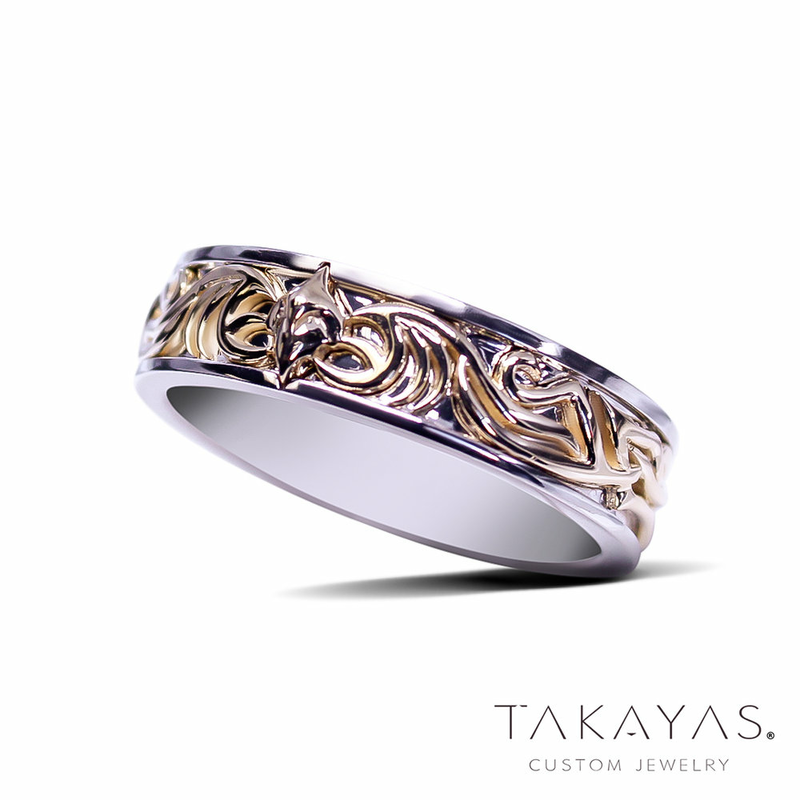 Dale and Lori asked Takayas Custom Jewelry to capture this "rise from the ashes" in the form of a matching set of Druidic-style wedding bands, representing the dawn of their beautiful relationship after past loves. For the design of their rings, Dale and Lori were inspired by mystical, Druidic themes. Rather than stick with your standard Celtic knot, however, they wanted to go beyond! Fashioning the shanks out of platinum, Takayas infused their rings with the regal nature of the Phoenix, a stylistic silhouette of its avian head serving as a dramatic centerpiece. Wrapping along the length of the band, he adorned the rings with filigree in 14K yellow gold, curled into the shape of the Phoenix's fiery wings. As a special touch, Dale and Lori chose to provide engravings for their rings. The inside of Dale's band reads "Never give up" - Lori's, "Never surrender". A sweet nod to the classic science-fiction comedy film Galaxy Quest, it also reminds us of the awe-inspiring power of the Phoenix - the ability to continue on in the face of adversity, to choose life and love all over again. When we presented them with their completed wedding bands, Dale and Lori were delighted! "They look wonderful!" Dale said. "We are very happy with them. Thank you for all your assistance in helping us through this process." Thank you, Dale and Lori, for giving us the opportunity to create a matching set of wedding bands with such an incredible and meaningful theme. We wish you a life of health and happiness - and for the love you share to continually grow as you reach new heights together, shining as bright as a Phoenix!